SPSCC’s Dental Assisting program brings together students from many backgrounds and connects them to a professional technical career that makes a difference in people’s lives. Near the end of the program, students participate in externships, giving them valuable clinical experience and connecting them with the local community. That connection is integral to the program, the success of its students, and the local dental community. Flashback to 1998, local dentist Dr. Chris Merchant worked each week at the SPSCC dental clinic, treating community members and helping prepare dental assisting students for the real world of dentistry. It was a chapter in a longer story; Dr. Merchant attended dental school at the University of Washington alongside Dr. Dana Larson, SPSCC’s Dental Assisting Program Director. Dr. 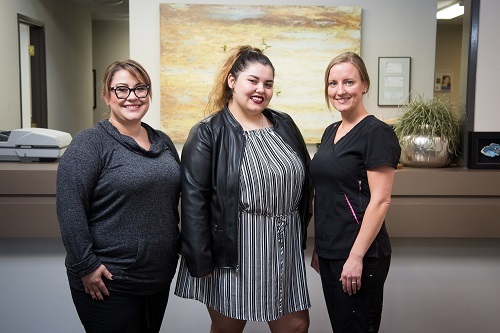 Merchant began building his private practice and, although he had less time to volunteer at the SPSCC dental clinic, he stayed connected in hopes of finding great dental assistants as his practice grew. When she began at SPSCC, Abbey knew she wanted to work in the health care field, but didn’t know what career was best for her. After finishing her prerequisite courses, she entered the Dental Assisting program and graduated in 2007 alongside 20 other students. She’s worked with Dr. Merchant ever since; she loves working both in the clinic and at the front office, following and helping the patient through intake and direct patient care. Jaclyn knew she wanted to work in dentistry ever since she had braces as a child. She remembered what a big change it was to like her smile and wanted to help others feel the same. Jaclyn worked in retail for several years after high school, then decided to make a change. She found scholarships and financial aid at SPSCC and began to focus on becoming a dental assistant. Jaclyn graduated in 2017, and has worked for Dr. Merchant since then. Bridget finished SPSCC’s Dental Assisting Program and began working with Dr. Merchant in 1998; she was his first dental assistant after he graduated from dental school. Bridget worked as an assistant for several years while training to handle the front office at the same time. For Bridget, it’s important that every patient is relaxed at the office and confident they are getting the best care. Twenty years later, she is an integral part of Dr. Merchant’s office.